One day we’ll have two definitive Disney movies. One made by the master himself (either Snow White or Fantasia); the other a drama that tells us something about the man himself. When will Hollywood give us a warts and all bio-pic that tells us about this influential story-teller? Oliver Stone, Johnny Depp are you listening? For now, we’ll have to settle for documentaries like Once Upon a Time: Walt Disney, which isn’t too bad a substitute, really. This respectful homage focuses on the young Disney, an animator fascinated by Europe. Walt loved the stories his German grandfather would read him, set on the colourful continent. With their romantic history and folklore Britain, France, Italy and Germany must have sounded a world away, literally, from the brush-stroke US history of Wild West pioneers, pilgrims and Indians. So it’s no surprise to learn that a young Disney traversed Europe acquiring a library of children’s illustrated fairytales and fables, and soaking up European artwork –all of which he wanted to bestow upon American children. 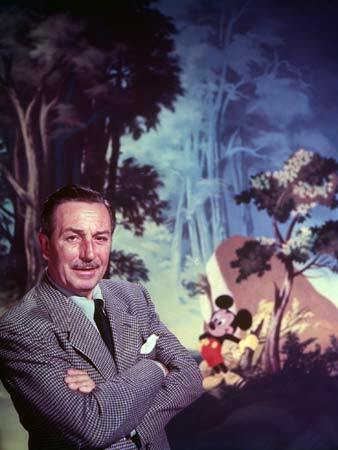 An astute businessman, Disney hired artists and illustrators who were more skilled than he. They brought a familiarity with German Romantics, Symbolists, the Pre-Raphaelites, Flemish artists and Italian primitives. Walt was also heavily influenced by Aesop’s fables, the works of Rudyard Kipling, Lewis Carol and the Brothers Grimm. As new films like King Kong and Frankenstein amazed mainstream audiences, Disney would echo their work in animated shorts. I’d never noticed Sleeping Beauty’s backgrounds so much until this doco alerted me to the precision work in the castle interiors and exteriors – all hand drawn, before CGI was invented. At just 60 minutes, this is by no means comprehensive. It doesn’t aspire beyond The Jungle Book to any live action features, nor recent masterpieces like Beauty and the Beast. I was longing to learn about the construction and politics of Disneyland itself (including suggestions Walt spied for the FBI). But for any child at heart, this remains a rich analysis of a remarkable storyteller. Once Upon a Time: Walt Disney airs 8:30pm Sunday on SBS. Looks interesting even though I’m not a huge fan of Disney. Although being a fan of the Grimm Bros and fairy tales in general I do like Snow White & a few others. Pinocchio is my favorite though.